#7 Sharon, 1 vs. #10 Pembroke, 3 – Final – Click here for a recap of the game. #11 Oliver Ames, 4 @ #6 Walpole, 1 – Final – Click here for a recap of the game. #13 King Philip, 2 @ #4 Mansfield, 1 – Final (OT) – Click here for a recap of the game. #8 North Attleboro, 4 vs. #9 Marshfield, 2 – Final – After conceding an early penalty kick, North Attleboro rattled off four straight goals to beat the Rams. Ashlyn Gaulin tied the game off an assist from Haley Ferrin and then Ferrin put North in front, finishing off a pass from Haley Guertin. Just before halftime, Aine Mendonca converted a service from Guertin to make it 3-1. Gaulin made it 4-1 in the second half off another assist from Ferrin. North head coach Bill Wallace said Rachel LaBonte, Emily Chiasson, Sam Hawkins, Julia Tolfa and goalie Nina Beauvais kept the Rocketeers composed. The Rocketeers advance to the Div. 1 South quarterfinal to face Natick. #6 King Philip, 2 @ #3 Somerset Berkley, 1 – Final (Penalty Strokes) – After Somerset Berkley seized the lead, King Philip’s Caitlin Donahue tied the game in the second half off an assist from Alli Meehan. After two scoreless overtime periods, the teams headed to penalty strokes. Christina Hathaway’s stroke proved to be the winner as KP won 2-0 in strokes – Liz Furfari also found the back of the cage. Abby Campbell stopped all four penalty strokes she saw. KP advances to the D1 South Semifinal to take on #2 Walpole on Wednesday. #2 Foxboro, 1 vs. #10 Holliston, 0 – Final – Catherine Luciano scored the lone goal of the game to send Foxboro into the Div. 2 South semifinal. The Warriors will face #3 Cohasset. NORTH EASTON, Mass. – Oliver Ames senior Dimitra Efremidis thought for sure that she had tied Wednesday evening’s division matchup with King Philip, but with 14 minutes to go her shot through traffic rang against the inside of the post and sliced across the face of the goal. That thin of a margin separated the Warriors and Tigers at Muscato Stadium, with KP holding on for a 2-1 victory. The margins are that thin in the race for the Kelley-Rex title as well, as the victory keeps the Warriors ahead of rival Franklin by a solitary point with just three games remaining in the regular season. Despite suffering a fourth loss in the past five games, first-year OA coach Abby Tepper was upbeat about the effort that the Tigers showed on senior night, pushing KP right to the final horn. The Tigers had plenty of chances throughout an entertaining game that saw both teams create scoring opportunities. It was the home team that cashed in first with Kendall Clifford’s cross from the right tipped in at the near post by Cristina Boudreau, through the five-hole of KP goalie Abby Campbell (six saves), just seven minutes in. KP nearly answered right back when a looping shot from Christina Hathaway was cleared off the goal line by Sarah Tetrault, who knocked the aerial ball down from shoulder height. A minute later and the Warriors did tie the game when OA goalie Katie Vamosi(six saves) was caught off her line and Alli Meehan found space to slide in a shot. Vamosi would make amends two minutes later with a sliding save to stop Caitlin Donahue’s shot from distance. After OA had a tying goal wiped away for a whistle, Efremidis would be denied not once but twice by Campbell. The first was on a diving save down low to the junior’s right and the second when Campbell managed to get a stick to a high, dipping shot off a penalty corner. The save looked even bigger with two minutes left until halftime. Again from a corner, KP worked the ball through the crease in front of goal and Elizabeth Furfari worked space in front to flick an off-hand shot inside the far post for what turned out to be the game-winner. 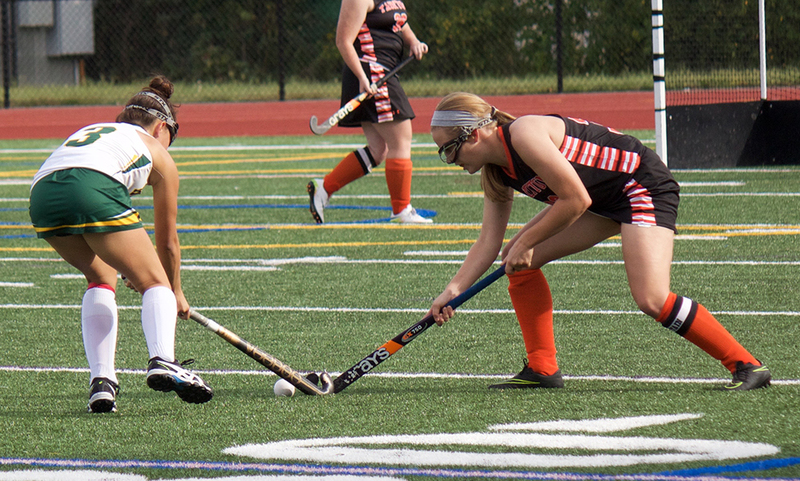 In the second half, OA pushed for an equalizing goal and the Warriors pressed to limit the space for Efremidis and the Tigers attackers to work in. Hathaway praised the effort of sweeper Emma Izydorczak and left back Kate Lindmark for closing up the space in front of goal and stopping the cross from the right that OA used to score the opening goal. The Warriors also created chances on the counterattack but were denied by Vamosi, who made four saves in the second half, and by defender Katie Davenport, who was a constant presence in the middle. The Tigers had already seen a shot get tipped just wide of the post, smacking the boarding on the outside of the goal and sending up a premature cheer from the bleachers, when Efremidis got free in the left channel and fired a low shot that looked destined for the corner. The senior could not mark her final regular season game under the lights at Muscato Stadium with a goal, as the ball clanged off the post and stayed out. King Philip (11-1-3, 10-1-2) will begin its final stretch at Taunton on Friday, before closing with Mansfield and Franklin. Oliver Ames (8-4-3, 6-4-3) will look to get back on track on Friday at home against Attleboro. 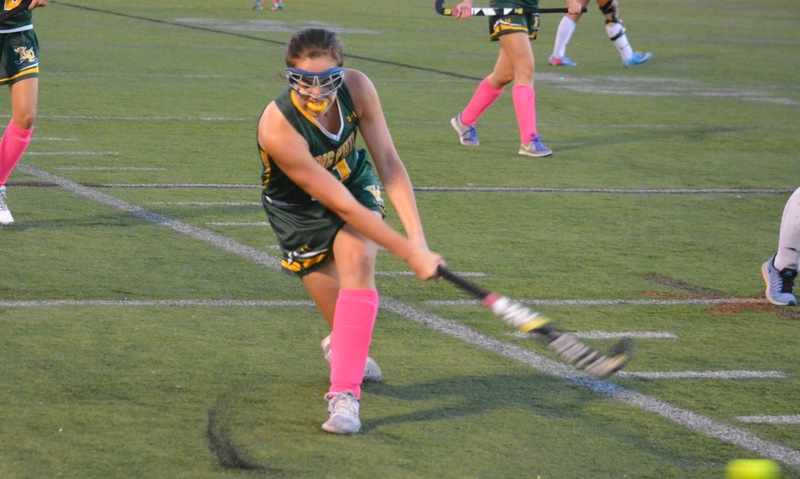 King Philip senior Caitlin Donahue has been selected as the HockomockSports.com Player of the Week for September 25th through October 1st; the fourth player chosen for the 2016-2017 season. 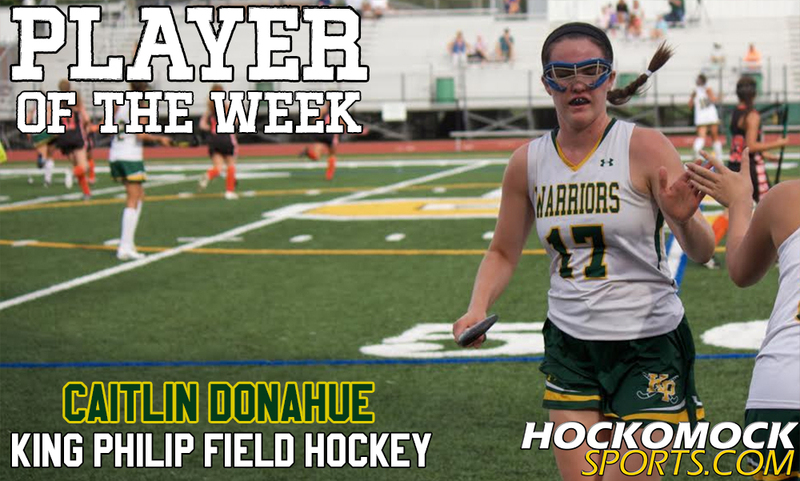 Donahue had an impactful week for the Warriors, netting goals in both of King Philip’s games this week. 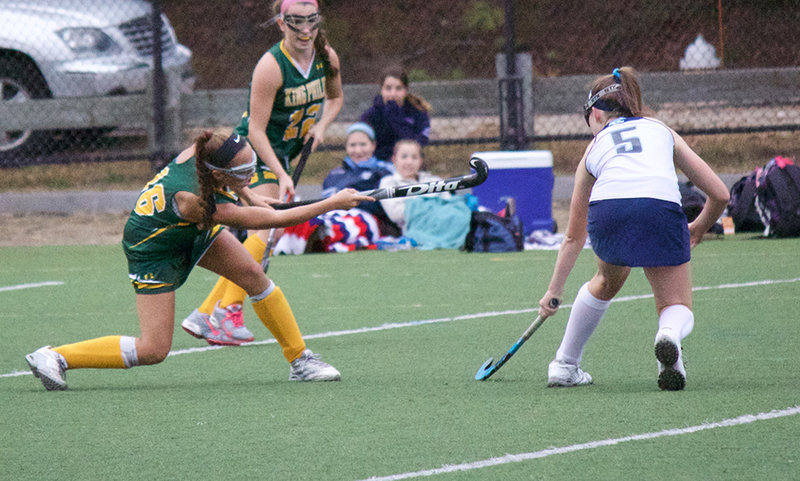 Donahue starred in King Philip’s 3-2 win over Mansfield on Monday afternoon, netting a hat trick. The senior attack opened the scoring in the first half on an assist from Alli Meehan to give KP a lead at halftime. After Mansfield tied the game, Donahue put KP up 2-1 on an assist from Christina Hathaway and then scored the game-winner off an assist from Meehan to complete her hat trick. Donahue netted her fourth goal of the week for King Philip (6-0-2) in Wednesday’s game against Franklin at the Beaver Street Turf. In the first half, Donahue put the visiting Warriors ahead as she converted a penalty corner from Nicole Conner. KP and Franklin finished the game tied 1-1. Donahue now has seven goals on the season. The Player of the Week is selected by the HockomockSports.com staff. Nominations can be submitted throughout the week up until Saturday night at midnight. There will be a poll posted on every Sunday with the nominations. The results of the poll influence the selection but do not strictly dictate the decision. HockomockSports.com Student Reporter Jaron May contributed to this report. FRANKLIN, Mass. – On a cold, rainy afternoon at the Beaver Street turf, Franklin and King Phillip battled hard for 60 minutes and finished level with a 1-1 tie. The two teams, who were both ranked in HockomockSports.com’s latest Hock 5 rankings, with Franklin at #1 and KP at #3, came into the game unbeaten in Hockomock League play. Early on, Franklin took control with two shots in the first three minutes, but sound defense from KP prevented the Panthers from scoring. After the first few minutes, KP took control for the majority of the rest of the opening half. After a promising scoring opportunity off of a corner was stopped on a clear from Franklin’s Kayla Marshall, KP cashed in. At the 13:14 mark, KP’s third corner of the opening half proved fruitful when sophomore Nicole Conner found senior Caitlin Donahue on the post to give KP an early 1-0 advantage. KP’s passing on corners made it tough for the Franklin defense, but they stood strong, as they stopped the Warriors on six of their seven corner chances. Franklin saw another scoring chance off their only corner of the first half at the 8:34 mark, but a clear by sophomore Caroline Klim maintained a 1-0 lead for KP. The Panthers started out the second half with two straight corners at 28:53 and 28:38, but big defensive stops by KP prevented the Panthers from scoring on either attempt. “Our defense was awesome, we’re the number one [defense] in the Hock, we were squashing everything, and denied pretty much everything,” KP coach Liz Hathaway said. At 24:45, Donahue had another scoring opportunity, but a save by Franklin goalie Christina Luccini kept the Franklin deficit at 1-0. Luccini came up big again for Franklin with 19:05 to go in the half, when KP’s Alli Meehan was all alone on a breakaway, but Luccini’s diving save knocked the ball away and back into Franklin territory. “Christina’s brand new, a first year varsity kid who’s only a sophomore, and has only been playing goalie for two years, but she’s aggressive and she has great instincts,” said Franklin head coach Lisa Cropper. Just over the halfway mark of the second half, Franklin’s Cassi Ronan’s shot got past KP goalie Abby Campbell to knot the game up at 1-1. After a save by Campbell off of a Franklin corner, KP had a corner of their own with 5:03 left in the second half, but the ball was knocked back into Franklin territory. Another Franklin opportunity with three minutes left was thwarted by KP, and the game would end in a 1-1 tie. “We didn’t play perfectly well the way we were hoping to, but they’ve improved a lot. I knew they would be tough, but they’ve improved a lot even more since I saw them at the beginning of the season, and I was really proud with the way the girls fought back and were able to tie it,” Cropper said. Franklin (4-1-3, 4-0-3) heads to Canton on Friday to take on the Bulldogs. KP (6-0-2, 6-0-2) will head to Stoughton on Friday for a matchup with the Black Knights. WRENTHAM, Mass. – King Philip used yet another stout defensive effort and cashed in twice on offense, rolling to an impressive 2-0 win over Taunton to remain undefeated. The back line for KP, composed of Monica Harvey, Caroline Klim, Emma Izadorzcak and Kate Lindmark, weren’t tested too often, but when they were, they stood strong. The defense was tested by Taunton a few times in the first half, but mostly towards the end of the game. In the first half, the Tigers threw a couple of attempts towards the net, but most pushing just left or just right of the net. In the second half, Taunton was able to weave the ball up the field, though the first few layers of the Warriors’ defense but couldn’t breakthrough. The combination of the back four and goalie Abby Campbell in net was able to shutout the Tigers and hold them to only two shots on goal. KP’s strong defense translated into an impressive performance from the Warriors’ offense and helped control the ball for most of the game. On the offensive side of the ball, KP’s Ali Meehan led the charge. She took control of the offense and was able to penetrate the Tigers’ defense multiple times throughout the game. Meehan was in on both of the goals, tallying two assists on the night. With 3:20 remaining in the first half, KP threatened with a corner. The ball was passed in and crossed over to Meehan who was waiting on the right, looking at a wide open net. She controlled the ball and lifted it, aiming for the opposite side. Her shot looked like it was going to be just wide until Nicole Connor came crashing in to tip it back in and put a point up on the board for the Warriors. A half hour passed by and Meehan and the Warriors created another chance. The Tigers’ goalie was able to come up with some big saves to keep Taunton’s hopes alive, but with 14 minutes remaining the Warrior attack was just too much. This time Meehan sent the ball across the goal and found Caitlin Donahue. Donahue then had an easy tap in for another KP goal. “I think it was great today because it was a total team win, everyone got some minutes,” Hathaway said.